Fluidizer Blenders are fairly new on the American industrial scene. The last 25 years has seen a steady increase in their use, but still, most ribbon blender users are not familiar with them. From the exterior, they look like a ribbon blender. But once you open the lid, you will see a large group of fluidizer blades going in all directions. These blades produce a very nice counter current flow while keeping the material in the blending chamber level. Their short length and the angle of the blades cause a much faster blend than the long, slow spiraling ribbon in a ribbon blender. Operations desiring to use a paddle blender for a more gentle mixing action will find that adding a Variable Frequency Drive (VFD), allows a fluidizer to handle the product gently like a paddle blender but blends the product much faster. We find that in most applications, fluidizers notably outperform both ribbon and paddle-type blenders. They simply have not been on the market for nearly as many years as ribbon and paddle blenders and therefore most industrial mixer users simply do not know about them. Equally as important, most blender manufacturers do not have the technology and do not make them. Customers who have tried Fluidizer Blenders have been impressed. Again, from the outside, a ribbon, paddle, and fluidizer blender all look alike. Cost wise, a fluidizer costs a little more because of all of the extra blades and steel required, as well as extra workmanship. However, in our opinion the speed and flexibility of the products you can blend versus the initial cost of the machine is well worth the small difference. Adding a variable frequency drive to these machines gives them tremendous flexibility with any current or future blending requirements. AIM Blending Technologies, Inc. manufactures a line of fluidizer blenders which run from a 5 cu ft blender up to a 500 cu ft version. Horsepowers can run up to 150 HP and each machine is sized and constructed based on the bulk density and special features of the customer's product. This ensures that each customer gets the performance they need for the products they produce. Our designs focus on high levels of sanitation and safety, while requiring only low levels of maintenance. Refer to the list below of standard equipment features. It illustrates that AIM Blending Technologies, Inc. includes more features on its machines as standard and at no extra cost than other manufacturers. In fact, AIM offers a written guarantee which states that we offer the most machine for the investment dollar of any manufacturer in the world. There are cheaper machines, but buyers who are looking for a blender with quality design and construction will see that AIM Blending packs more quality features and superior craftsmanship into its blenders than anyone else at a comparable price. 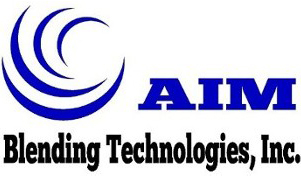 AIM Blending Technologies, Inc. stands for giving customers the most value for their investment dollar. Call our sales team today to discuss your needs, our designs, and what extra quality you can get with your investment dollar when you AIM For The Best. Sample blends are welcome. AIM Blending Technologies, Inc. produced the showroom blenders for two of the nation's largest nutraceutical manufacturers. Each company selected a 350 cu ft blender for their showroom. One company chose a low bacteria/mirror finish on both the inside and outside of the blender, including the frame and motor mount. Both companies are exceptionally proud of their real "live production" showrooms and use them for their customer tours.